ABOVE: A fresco entitled “The Crucifixion” and was painted in 1350. The fresco is located above the altar at the Visoki Decani Monestary in Kosovo, Yugoslavia. The two objects in the painting, which could be considered UFO’s, are enlarged below. While the UFO phenomenon may have gained popularity in the second half of the 20th Century, there have been many cases documented that indicate that the phenomenon may actually have occured often over the centuries. One of the more famous ancient UFO sightings could have been the possible sighting in the first chapter of Ezekiel. But this was certainly the only reference to strange flying objects. There have been many references to flying objects or vehicles in the Mahabharata and also various historical paintings over the centuries that clearly indicate that people of that time had either seen or heard of some kind of saucer-shaped craft. In many cases, the depictions in the paintings even suggest some kind of deep-rooted relationship between UFOs and religion. The above picture shows Jesus and Mary on what appear to be disc-shaped lenticular clouds. It is titled “The Miracle of the Snow”, by Masolino Da Panicale (1383-1440). It hangs at the church of Santa Maria Maggiore, Florence, Italy. This account was written six hundred years before Christ. The Greeks and Romans have also written about such things like phantom chariots appearing in the night sky. During the reign of Charlemagne, there were many accounts of “tyrants of the air, and their aerial ships.” Charlemagne was so concerned at these reports that those reporting these phenomenon were put to death. In Asia there are older artwork with images that look like UFO´s. These images of two crusaders date from a 12th century manuscript ” Annales Laurissenses” (volumes/books about historical and religion events)and refer to a UFO sighting in the year 776, during the siege on Sigiburg castle, France. The Saxons besieged and surrounded the French people. They both were fighting when suddenly a group of discs (flaming shields) appeared hovering over the top of the church. It appeared to the Saxons that the French were protected by these objects and the Saxons fled. “The Annunciation” by Carlo Crivelli, and hangs in the National Gallery, London. A disk shaped UFO-type object throwing down a beam of light down onto Mary’s head, is shown in detail. The above is a painting on wood drawer from furniture kept at the Earls D’Oltremond, Belgium. Moses is receiving the tablets and several objects in the sky are seen near by. Date and artist unknown. This supports the claims of many that many biblical events, can be further explained when ufos and aliens are taken into consideration, higher forms of technology could explain some of the events such as writing on stone with fire, parting the red sea, etc… higher forms of technology might explain how some of these feats were performed. This painting is called “The Madonna with Saint Giovannino”. It was painted in the 15th century. The Palazzo Vecchio lists the artist as unknown although attributed to the Lippi school.Above Mary’s right shoulder is a disk shaped object. Below is a blow up of this section and a man and his dog can clearly be seen looking up at the object. As unexplained mysteries go, the pyramids of Giza in Egypt really are something special. We still don’t really know how the Egyptians built the largest pyramid of all, known as the Great Pyramid of Cheops (or Khufu), some 5,000 years ago. Remember, this was even before the invention of the wheel. More wheels! This picture shows a UFO sighting over Hamburg, Germany 4 November 1697. The objects were described as “two glowing wheels”. This is a renaissance illustration of a UFO sighting in Rome detailed in a book “Prodigiorum liber” by Roman historian Julio Obsequens – “Something like a sort of weapon, or missile, rose with a great noise from the earth and soared into the sky”. This is a tapestry called Summer’s triumph and was created in Bruges in 1538. It now resides at the Bayerisches National Museum. You can clearly see several disc shaped objects in the top of the tapestry. Someone has speculated that they are islands, if so, then these islands are floating in the sky. 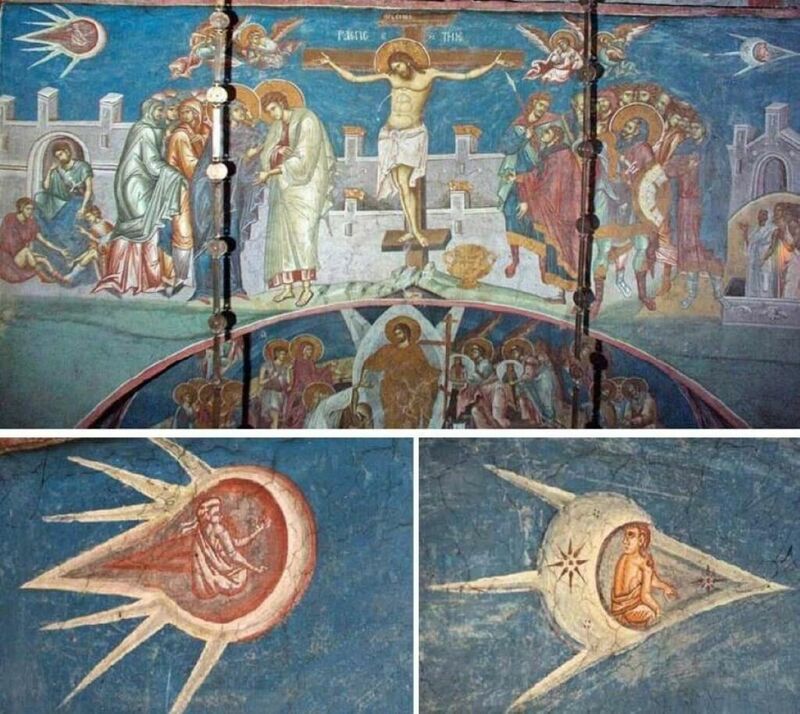 Christian art, UFO crucifixion detail A 17th century fresco from the Svetishoveli Cathedral in Mtskheta, Georgia. The two saucer shaped objects on either side of Christ contain faces, which can be seen in the detail image. 1660. The illustration depicts a sighting by two Dutch ships in the North Sea of an object moving slowly in the sky. It appeared to be made by two disks of different size. The source for this account is one of the books entitled :”Theatrum Orbis Terrarum” by Admiral Blaeu. These books were compilations of articles by different authors and consisted of detailed accounts of long engagements at sea, cartography information etc. The above illustration depicts a sighting that occurred at 9.45pm on the evening of 18th August 1783 when four witnesses on the terrace of Windsor Castle observed a luminous object in the skies of the Home Counties of England. The sighting was recorded the following year in the Philosophical Transactions of the Royal Society. According to this report, witnesses observed an oblong cloud moving more or less parallel to the horizon. Under this cloud could be seen a luminous object which soon became spherical, brilliantly lit, which came to a halt; This strange sphere seemed at first to be pale blue in colour but then its luminosity increased and soon it set off again towards the east. Then the object changed direction and moved parallel to the horizon before disappearing to the south-east ; the light it gave out was prodigious; it lit us everything on the ground. ; The image was captured in this by Thomas Sandby (a founder of the Royal Academy) and his brother Paul, both of whom witnessed the event. This broadsheet picture by Samuel Coccius illustrates a UFO sighting over Basel, Switzerland in 1566. ‘Large black Globes’ appeared in the skies. It is held at the Wickiana Collection, Zurich Central Library. This is an illustration from a book “Ume No Chiri (Dust of Apricot)” published in 1803. A foreign ship and crew witnessed at Haratonohama (Haratono Seashore) in Hitachi no Kuni (Ibaragi Prefecture), Japan this strange object. According to the explanation in the drawing, the outershell was made of iron and glass, and strange letters shown in this drawing were seen inside the ship.